Taglit-Birthright Israel’s 10-day trip to Israel has a mission to connect young Jews, ages 18 to 26, not only with Israel, but with their Jewish identity and each other. Once a year, a very special trip takes place for young adults for whom making connections is a challenge. The participants on this Birthright trip have Asperger’s Syndrome. “With Asperger’s, the main disability is social,” said Leesa Fields, whose son Jeremy Band was a participant on the Dec. 23-Jan. 3 trip. Even though the family has traveled extensively throughout their son’s life and Band has been on a plane by himself, this was the first group trip he took by himself. Band, who holds both a bachelor’s and master’s degree in library science from the University of Maryland, is considered “high functioning.” Fields explained that while there are many programs for low functioning, she has found few options for high functioning, something, she believes that makes this particular experience unique. Blas, who directs the Tikvah program for special needs campers at Camp Ramah in New England and runs a trip to Israel for the Tikvah campers every other year, was contacted by Rabbi Elyse Winick, director of KOACH, to help with the Birthright trip. He explained that while, in many ways, this was a regular Birthright trip, some modifications were made for the participants – there were fewer participants (20 versus 40 or 50), a greater staff to participant ratio and some large crowd events, like a concert, were eliminated from the trip. Added to this trip was a meeting with Shekel, a group of Israeli young adults with Asperger’s. 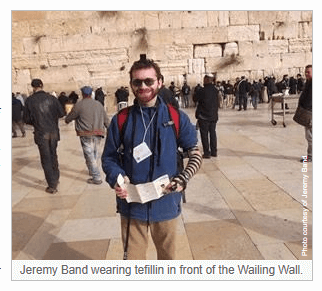 “I would have enjoyed getting to know them more,” said Band of the meeting with Shekel. While he had been told for years to go on a Birthright trip, it was when he realized that this was his last chance to go that he signed up. Band, who was honored with the group’s “paper plate award” for “most brutal honesty,” stays in touch with fellow participants through a Facebook group and shared a recent Shabbat dinner with another local participant. He has plans to travel with a friend to Italy this spring with a group of retired female librarians. The Taglit-Birthright Israel trip with Shorashim in partnership with KOACH runs every December. Registration opens in September; however, they are collecting a list of interested participants now. For more information or to express interest, go to israelwithisraelis.com.